Have you ever been interviewed for the job of your dreams? 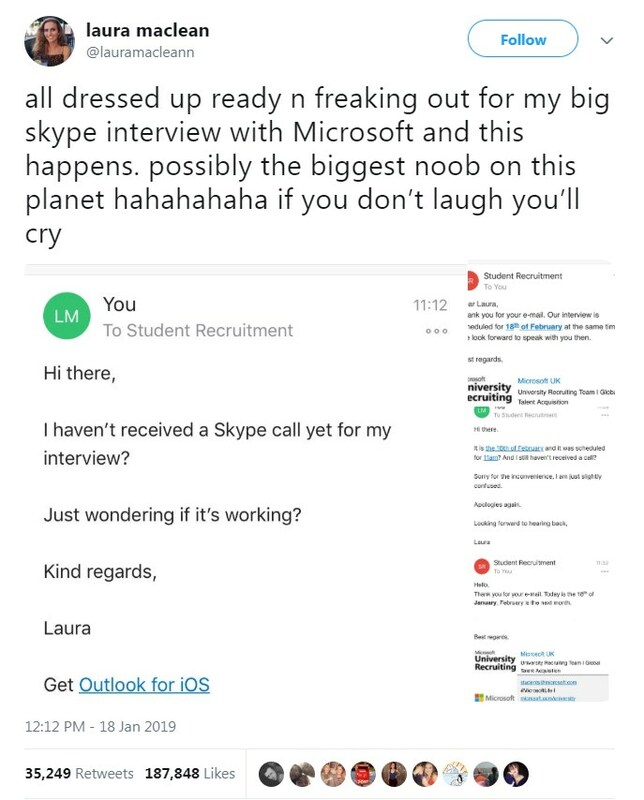 Meet Laura Maclean, 21, a Scottish student, who was invited to do a job interview via Skype with Microsoft’s University Recruitment team. Suddenly, something went wrong. The Typical Student team shares her exchange with the Microsoft HR team, and it has turned out to be a hilarious mix-up. Recently, this 21-year-old student has shared her interview experience on Twitter, and the Twitterverse was shaken. According to Laura, she was invited to do a job interview for Microsoft on February 18th. However, the girl was so anxious to get employed for the job of her dreams that she showed up for the interview a month earlier! Eventually, Laura figured out it wasn't the day of her interview and decided to wait. How Did the Twitterverse React?